A company that provides terrain modelling to the landscape design and planning professions is pioneering what it claims is a new approach to landform and visibility analysis. Convincing a new client to involve a landscape architect at the beginning of a project can be very difficult, says Gordon Citrine, director of Citrine UK, ‘but we’ve developed a useful tool to help them get an early foot in the door’. Landscape Visual Capacity Analysis is pertinent to planning and primarily marketed to developers, he explains, ‘but it is also relevant to landscape professionals since it offers a good way for them to become more involved at early planning stages – historically a difficult nut to crack’. 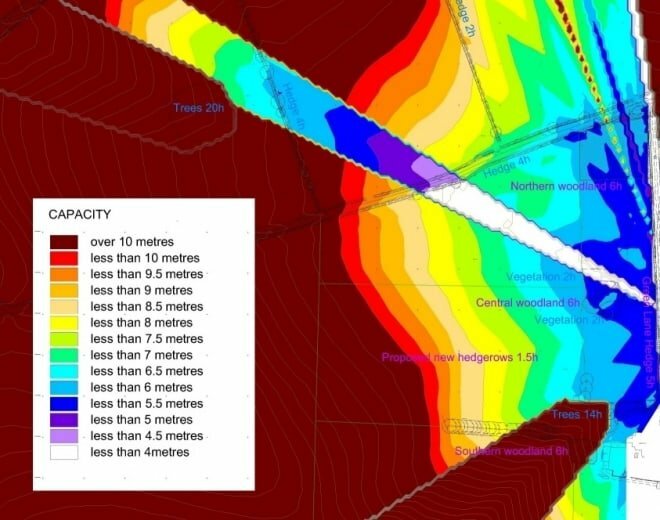 The use of terrain modelling to assist site design and area planning has been much overlooked, Gordon explains, ‘and in many cases we are asked to create visibility analyses and photomontages for a fait accompli – a finished project’. While the zone of theoretical visibility (ZTV) of a preconceived design provides useful feedback, ‘it’s cumbersome and costs mount up with design iterations if you don’t get the answer you first wanted’. ‘Surely’, Gordon argues, ‘it’s better to request the visual capacity of the landform to accommodate new development before site layout design begins? Turning the old question around gives you an incredibly powerful result, a shaded contour plan showing how the visual capacity varies across an area’. This, he says, enables the design process to be informed and facilitates good design instead of mitigating after the event for insensitive ‘helicopter’ planning – ‘an altogether more expensive approach, not only through the planning and consultation process, but also in terms of building costs.